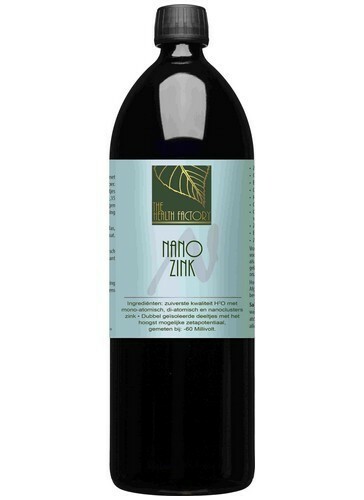 Nano Zinc is a mineral water produced according to unique method, consisting of purified water containing 20mg / l (20ppm) ultra-small particles of pure zinc. Purified water with 20mg / l (20ppm) ultra-small particles of pure zinc. Nano zinc is a revolutionary new form of zinc. When zinc particles are a few nanometers small (1 nanometer is one millionth of a millimeter), the effect is particularly powerful. The smaller the zinc particles, the brighter the color and the better it works. The Health Factory packages its products in high quality dark violet glass, which only transmits infrared and UVA radiation. This means that the product can be kept for much longer. Why nano zinc? • Nano zinc can be used both internally and externally. • Is therefore 100% bioavailable and is absorbed much faster. • Nano zinc requires less than a zinc salt for a comparable or even better result. • Nano zinc is an elemental mineral with a high vibrational frequency. • Nano zinc is 100% pure and free of additives. 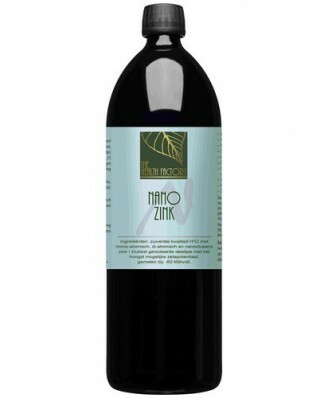 • Nano zinc is taste and odorless. Very suitable for children. • Keep the liquid in the mouth for 1 minute before swallowing for optimal absorption through the mucous membrane. • Treat complaint dosage: 30 ml per day. • Maintenance: 10-20 ml per day. For Children: -Up to 2 years: 1 teaspoon / 5 ml per day. -2-6 years: 1 tablespoon / 10 ml per day. -6-12 years: 2 tablespoons / 20 ml per day. Externally nano zinc can be applied (eg in a spray) to the skin and eyes and in the throat.